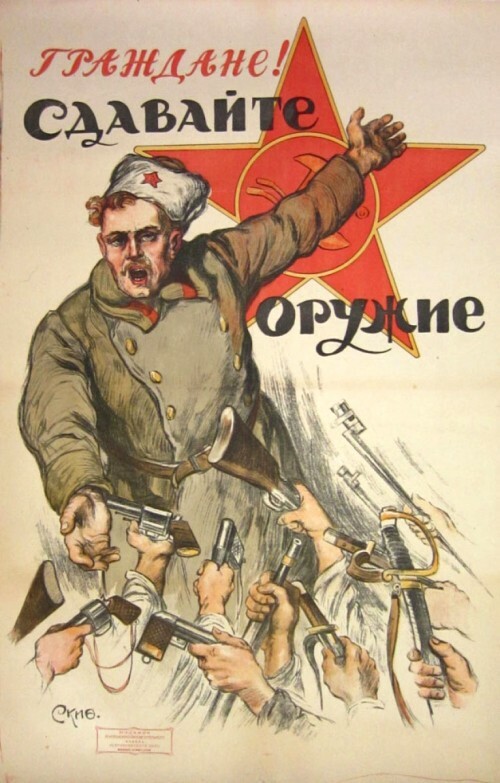 Poster says, "Comrades! Turn In Your Weapons." Oops! Sorry! Guess it's not one from our earstwhile prez. .... Yet. And how we burned in the camps later, thinking: What would things have been like if every security operative, when he went out at night to make an arrest, had been uncertain whether he would return alive and had to say good-bye to his family? Or if, during periods of mass arrests, as for example in Leningrad, when they arrested a quarter of the entire city, people had not simply sat there in their lairs, paling with terror at every bang of the downstairs door and at every step on the staircase, but had understood they had nothing left to lose and had boldly set up in the downstairs hall an ambush of half a dozen people with axes, hammers, pokers, or whatever else was at hand? After all, you knew ahead of time that those bluecaps were out at night for no good purpose. And you could be sure ahead of time that you’d be cracking the skull of a cutthroat. Or what about the Black Maria [Government limo] sitting out there on the street with one lonely chauffeur — what if it had been driven off or its tires spiked. The Organs would very quickly have suffered a shortage of officers and transport and, notwithstanding all of Stalin’s thirst, the cursed machine would have ground to a halt! National Rifle Association homepage here. Gun Owners of America homepage here. Wikipedia article on Alexander Solzhenitsyn here. Be sure to check out the "I Second the Motion" section on the right side of this page for more pro-gun links. Go to Jays' Tee Vee blog main page here. Christian Anime: Any Out There?